The Holywood star crashed to an eight over par 80 to finish ten shots behind stablemate Charl Schwartzel after dropping six shots in a nightmare three-hole stretch from the 10th. “I am very disappointed. I was leading this golf tournament with nine holes to go and I just unravelled,” he said of a nightmare run that began with a triple bogey at the 10th and continued with a three-putt bogey from seven feet at the 11th and a four-putt double bogey at the 12th. McIlroy recalled two similar disasters by friends as they led majors into the final round last year - Dustin Johnson shooting 80 in the final round of the US Open at Pebble Beach and Nick Watney taking 81 on the last day of the US PGA. “A couple of pretty good friends were in a similar position to me last year in Dustin Johnson and Nick Watney,” he said. “I knew it was going to be very tough out there for me today. Pals Johnson and Watney suffered final round meltdowns in majors last year, having led by three after 54 holes. Johnson had a quadruple bogey eight at the second hole and shot 82 when leading the US Open at Pebble Beach while Watney crashed to an 81 in the US PGA. Asked what caused his seven over par back nine, McIlroy said: “I think it is Sunday at a major and what that can do. It was my first experience at it and hopefully the next time I am in that position I will be able to handle it a little better. “I didn’t handle it particularly well today obviously but it was a character building day, put it that way and I will come out stronger for it. “I was fine, I was confident earlier today. I hit the ball well on the range. I played okay on the front nine and a couple of putts didn’t drop. “I hung in there and had a one shot lead going down 10. When you have a one shot lead going into the back nine of the Masters you can’t be doing that much wrong. “Hopefully I’ll learn from it and come back a little stronger. It was my first experience of being in the lead going into the last day of a Major and I felt as if I did okay on the front nine and I was still one shot ahead going into the tenth and then things went all pear shaped after that. “Hopefully if I can get myself back into this position pretty soon I will hopefully handle it a little bit better. 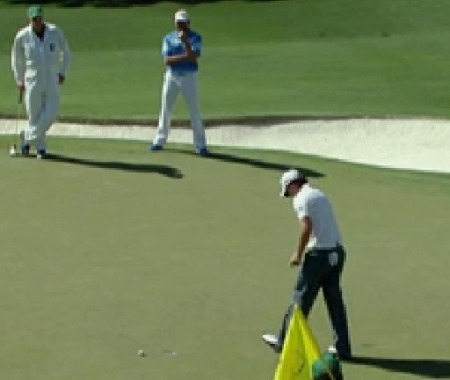 Rory McIlroy chips out of the trees right of the seventh in the third round of the Masters. He made a double bogey that derailed his title chances.Rory McIlroy admits that last year’s 10th hole nightmare drove him to distraction and led to another Masters meltdown. 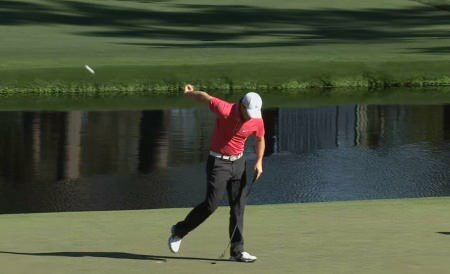 The Ulsterman’s determination to eliminate the dangerous pull-hook from his game backfired totally at Augusta as he lost his ability to hit the high draw.